EWC Senior Education Fellow, Siegfried Ramler has a remarkable life and has been part of critical moments in history. During his childhood in Austria, he experienced annexation by Nazi Germany and escaped to England via Kindertransport. While living in London, he experienced the World War II Blitz. Later on, he became an interrogator and simultaneous interpreter at the Nuremberg War Crimes Trials, which placed him in contact with Nazi leaders in the defendants’ dock. His marriage to a Hawaiian court reporter on the Nuremberg staff led to a move to Hawaiʻi and the beginning of a long career at Punahou School as teacher, administrator and founding director of the Wo International Center. 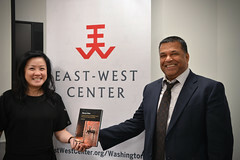 His long experience in international education brought him to his current affiliation with Hawaiʻi’s East-West Center, where he collaborates with educational leaders and institutions in the Asia Pacific region. 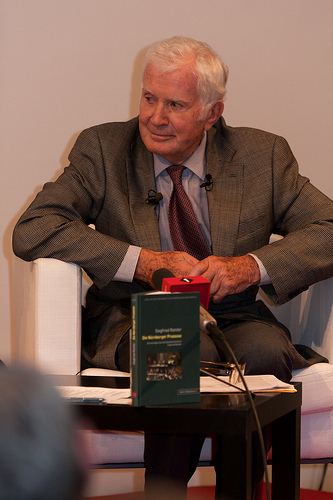 Sig Ramler had a recent trip to Europe for the 65th anniversary of the Nuremburg Nazi war crimes trials, where he was a translator and helped pioneer simultaneous translation techniques. Here is his personal retrospective on this trip. Living and speaking in an English language environment for more than six decades, I was apprehensive about making German language presentations to large groups in a formal setting. In fact there was no reason to worry. My German skills lay dormant and rose to the challenge with hardly any language deficit. As to the content of my talks, I adapted my approach to the audience, basing my remarks on the German language edition of my book. I would speak extemporaneously on key points, leading up to a selected passage in the book which I would quote as a way to stress its impact. This mix of informal, conversational lead-ins with the reading of quotations worked quite well. When I spoke to a group of language or interpreting students, my remarks would aim at the technical challenges of simultaneous interpretation, pioneered at Nuremberg and of particular interest to that target group. The questions and discussions following my talks would vary according to the make-up of the audience. While the interest in the Nuremberg theme was high, judging by the large attendance at the various presentations, it was evident to me that my audiences related to the Nazi period and the Nuremberg trials as historical events far in the past. My experiences as a participant in the conduct of the trials could not resonate with most of my younger audience in the way they would for someone who lived through that period. Except for myself, there were very few, if any, octogenarians in the audiences who had a personal memory of the Hitler period. One unexpected honor in Vienna was the bestowal to me of a decoration presented at the elegant reception salon of the City Hall by the Mayor, represented at the ceremony by the Deputy Mayor Michael Ludwig. I was presented the “Goldener Rathausmann”, a golden statuette depicting the figure at the top of the gothic Rathaus structure. 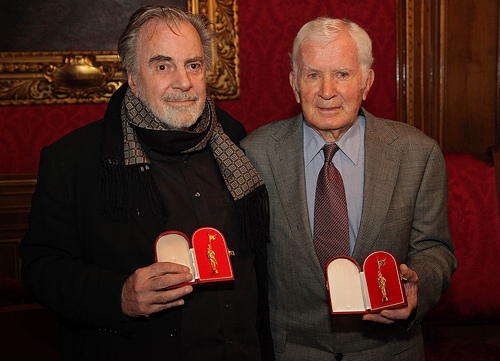 Also receiving the honor at the same function was Maximilian Schell, the international actor, who had received an Oscar for his portrayal of a defense lawyer in the film “Judgment at Nürnberg.” Among past recipients of this honor I found myself in such company as Pele, Pierre Cardin and Gregory Peck! In Germany the main event of my lecture tour took place at the Nürnberg Palace of Justice in the historic courtroom 600, scene of the major international trial and several subsequent proceedings. Coming back 65 years later to a setting where I had spent many hours, both in the interpreters booth and on the tier below the judges row, felt like the completion of a circle which traced and defined my life leading to and from Nuremberg. Though the courtroom had been restored and reconfigured, I oriented myself immediately, locating the main areas: judges bench, defendants dock, defense counsel rows, prosecution teams, interpreters cabins, witness seat and spectators. It was a nostalgic event, giving me a flashback to my functions and placing me in Nürnberg as a 21 year old lad. The courtroom was filled with ticket holders for my presentation, drawing a mix of jurists and general public who were also given an opportunity to visit the just opened museum “Memorium Nürnberger Prozesse”, located in the space above the courtroom. I spoke from the witness rostrum where greetings and introductions were expressed by the President of Nürnberg’s Supreme Court, by the President of the Federation of Interpreters and Translators, and by the Director of Museums in the city of Nüremberg. Prior to the courtroom presentation I met student groups in the Palace of Justice who had travelled to Nürnberg from other locations in Germany to meet with me. In response to invitations from schools in Germany, I also spoke to various student groups at secondary schools. I felt that it was especially important to meet with students and engage them in dialog about a key event in German history. Generally, both in Austria and Germany, I found my audiences to be most interested and receptive. 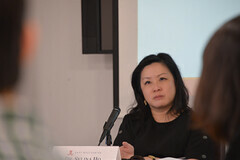 The audience interest focused strongly on my sharing of personal impressions and experiences, such as my profiles of the accused in the defendants dock, their personalities and their reactions to incriminating testimonies and documents. There was also interest in the language challenges we faced, particularly in the pioneering of simultaneous interpretation. A frequent personal question directed to me concerned my attitude and feelings about the atrocities committed by the Nazi regime, about the persecution and forced eviction of my family, and how this experience influenced my attitude and work at the Nuremberg trials. In response I stressed my professional obligation as a linguist and interpreter, focusing on the crucial language challenges I faced. As to the meaning and impact of the trial, it was only later, with greater maturity, that I reflected, wrote and spoke about the legal and moral issues arising from Nürnberg. An undercurrent running through the revelations at the trials raised a fundamental question: how was it possible for such atrocities to be committed in the name of Germany, a nation with a rich cultural tradition in literature, science and the arts, a pillar of European civilization? When speaking or writing about Nuremberg, I respond to this question by extending it beyond Germany and giving it a universal significance. When checks on governmental power and control do not exist, when a dictatorship disregards and nullifies existing laws, when the achievement of a desired end for a nation justifies any means to obtain it, when persecution of segments of a population becomes government policy, and when the world community fails to react to crimes being committed by a dictatorship, the result leads to the abyss into which Germany descended during the Nazi period. In this sense the Nuremberg legacy, as a cornerstone of international law, takes on a universal significance beyond the role of Germany during the Hitler regime. In my talks and discussions during the book tour in Austria and Germany it is understandable that the interest of my audiences was focused on the Nuremberg Trials. 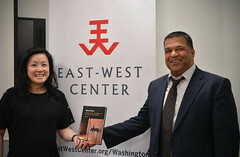 Beyond Nuremberg, however, my career spans over six decades in pedagogy and educational programs, presently with the East-West Center in Hawaii, where my work relates to educational challenges for the United States and the Asia-Pacific region. In summing up events and experiences over the years, I am convinced that in facing 21st century challenges to global peace and survival, education represents the most important element in our quest for a harmonious world. I feel blessed that in a small way I have been given opportunities to contribute to this mission. This entry was posted in Alumni, Education and tagged Maximilian Schell, Memorium Nürnberger Prozesse, Nuremberg Museum, Nuremberg Trials, Siegfried Ramler. Bookmark the permalink.